Freud Tools makes professional cutting tools specifically designed for superior performance and maximum life. Each product is carefully crafted using the best materials, leading innovative designs, and the most sophisticated manufacturing process. 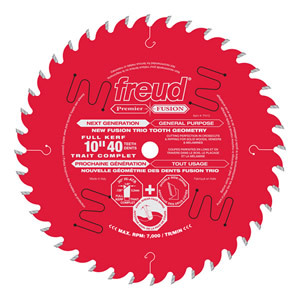 For example, each Freud saw blade takes up to 35 manufacturing steps. Mississauga, ON - Typically, trade professionals, cabinet makers and serious DIYers own an assortment of table saw and mitre saw blades. 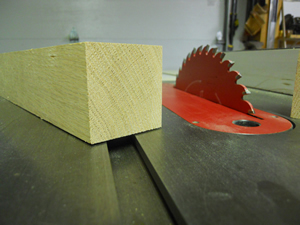 Blades with varied tooth counts and designs are needed for cutting different wood materials. Freud’s new Premier Fusion blades eliminate the need to own multiple blades. The Premier Fusion blades have a completely unique new tooth design that allows a single blade to provide the highest quality cuts in virtually all materials. The blade can be used for flawless ripping or crosscutting in hardwoods, softwoods, laminates, melamine, veneered plywoods and thick stock lumber, eliminating the need to change blades for different applications. an axial shear face grind that reduces resistance and eliminates tear-out on all types of cuts. 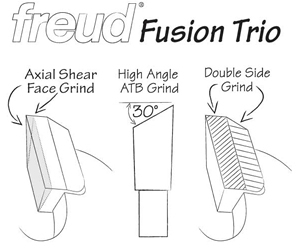 Of note, the Freud Premier Fusion blades are the only blades available with an axial shear grind on the teeth. Using a Premier Fusion blade saves time by eliminating the need to change blades for different materials and improves overall productivity and cut quality. The unique grind pattern also extends the life of the blade and runs quieter than other saw blades. Premier Fusion blades are available in four diameters, in both full kerf and thin kerf: 8” 34-tooth, 10” 40-tooth, 12” 48-tooth and 14” 54-tooth. TiCo (Titanium Cobalt) Hi-Density carbide for a sharper edge and flawless finish with dramatically longer cutting life. Laser-Cut anti-vibration slots to drastically reduce vibration and sideways movement in the cut extending blade life and giving a crisp, splinter-free flawless finish. Perma-Shield™ non-stick coating to reduce blade drag and protect the blade from corrosion and pitch build-up.